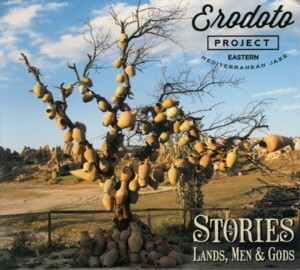 This is an album by Italian Jazz quartet Erodoto ProjectFind albums by this artist, led by saxophonist Bob SalmieriFind albums by this artist, with pianist Alessandro De AngelisFind albums by this artist, bassist Ermanno DodaroFind albums by this artist and drummer Giampaolo ScatozzaFind albums by this artist. Trumpeter Gabriel Oscar RosatiFind albums by this artist and percussionist Carlo ColomboFind albums by this artist appear as guests. The album presents eleven tracks, six of which are originals by Salmieri and four by De Angelis, and one is a Pop song by the legendary crooner Domenico ModugnoFind albums by this artist. The music is melodic mainstream European Jazz, which incorporates subtle World Music influences, mostly Middle Eastern and Latin. All the melodies are beautifully and carefully woven, which is quite typical of Italian Jazz, known for its strong ties with melody and harmony. There is a wide stylistic diversity within the compositions, which of course generates new interest with each of the tracks. The overall level of the compositions is truly impressive. The performances do not fall behind the compositions and all four members of the quartet and the quests are highly skilled and more importantly highly sensitive players, who are able to make the most out of the compositions and present an excellent ensemble effort, as well as play impressive solos. Salmieri, who plays tenor and soprano saxophones, ney (Middle Eastern end-blown wooden flute) and clarinet, proves to be a multitalented player and his solos are all top notch; De Angelis is wonderfully harmonious and elegant, and the rhythm section drives the music firmly and skillfully. Overall this is a very pleasant and rewarding musical experience, which proves that sophisticated and well done mainstream Jazz is still relevant, especially when created by European musicians. The album also offers splendid sound quality and altogether should satisfy most Jazz connoisseurs the world over. Well done!